The Dragon Chronophage is the third Chronophage. 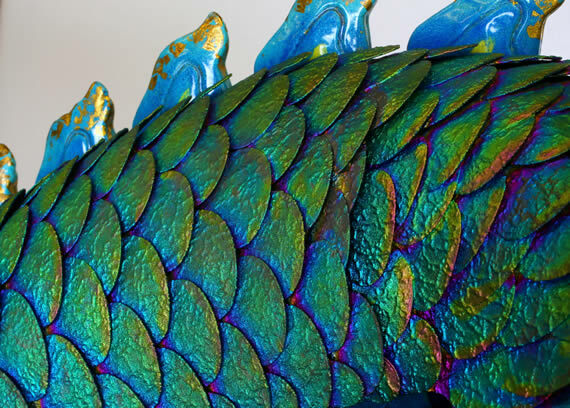 From the shimmering scales of the Dragon to the polished gold of the clock face, it is a stunning object and at three metres tall, it dominates any room in which it is displayed. I was delighted to collaborate with Professor Long of China Academy of Art, Hangzhou, to ensure the authenticity of the Chinese dragon. Coincidentally, the word ‘Long’ means Dragon in Chinese. 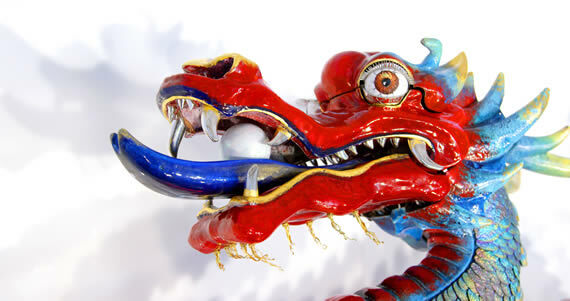 Not only is the Dragon Chronophage a piece of art and a design icon, it is also a pioneering piece of technology. It is incredibly popular because it interacts with its audience, most of whom posed for a selfie! The Dragon was recently exhibited in Shanghai at Design Shanghai, where it wowed and entertained the audience. I wanted the Dragon to engage and play with the spectators, as with the others, so the Dragon winks, swishes its tail, rolls out a pearl and ripples its spine. I stopped short of making it breathe fire – only for health and safety reasons. Below is a brochure about the Dragon Chronophage. We’ve also published the brochure in Chinese, which you will find here. 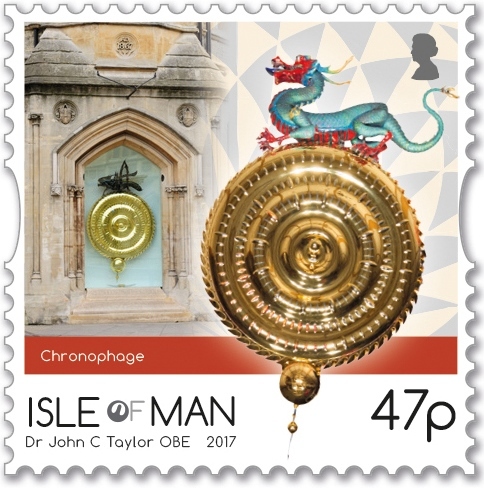 I’m thrilled that the Isle of Man Post Office has produced a wonderful set of postage stamps highlighting my life’s work and that one stamp shows both the Corpus Chronophage and the Dragon Chronophage.